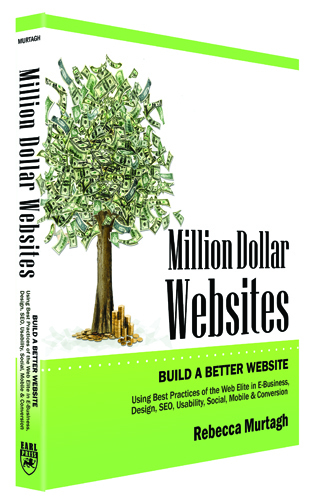 My first book Million Dollar Websites, is published and I couldn’t be more excited! Writing a book is no small undertaking, as those who have done it will tell you. When writing a non-fiction title, having a compelling reason to put it all “out there” makes it all worthwhile. Why did I write Million Dollar Websites? I wrote this book to empower those who depend on a website to make better decisions, save time, money and realize the full potential of the website investment. For many years, I (and others like me) have been approached by organizations of all sizes to figure out why their website is not delivering the results they need to be successful, and how to make it better. From multi-national corporations to the solo-entrepreneur, the goal of the website may be different, but the challenges are often quite similar. Optimization is great, but I always feel the frustration and pain of businesses who wish they’d had ample insight to get it right the first time. 99% of website failures are 100% preventable. Most websites emerge from “project-dom” unable to deliver results and ROI. Web designers, developers, SEO’s, copywriters, webmasters and marketers are focused on delivering the best of their craft. While they may be very talented in delivering their professional contribution; design, coding, search engine optimization, copy and technical management of the website, few, if any, have a horse in the race, so to speak. So, when left to guide decisions to get the project done, consume the budget, and/or generate profit related to their bottom line, little consideration may be given to how the website will support the bottom line of the business the website was created for once it is live. I explain what must change in this dynamic. After all, the very day the website “project” goes live, these professionals move on to the next project. They must, as it is the core of their profession. However, on that very same day, for the business or brand the website was created for, the website is expected to evolve from expense to asset. After inheriting the website, many will struggle to quantity, measure, maintain or improve the success of the website, and very often leave it to run its course to obsolescence. In the book I outline how to manage the website process in a way that makes everyone’s contribution more meaningful, efficient and effective. Gain insight from those I call “the web elite” and learn how simple tools can enable you to communicate more effectively with the talented professionals that will create the most visible aspect of your brand. By proactively managing the process, you make everyone’s contribution more productive, enjoyable, and significantly increase the ability of the website to deliver the results needed to compete and win online today. The information I share in this book has saved many, many clients many thousands, tens or hundreds of thousands of dollars, over the years. Although the agency, vendor or web team may have been satisfied with the outcome, it has cuased me much pain to witness businesses and brands feel victimized and frustrated after investing a sizable budget into the website. The web industry has conditioned those in the industry, and those who purchase web services, to view the website as a budget line item every one, two or three years, rather than the vital business asset it can, and should be. When the business does not own the process, the website (very) often fails to meet expectations and goals. In the book, I provide a clear path to building a better website, emphasizing the important role leadership from the business or brand plays, while outlining, step-by-step, what needs to be done before any entering into any discussion about website design, budget or features. Million Dollar Websites outlines what it takes to create a successful website…whether you are a large corporation, small business, or a business of one. Instead of delivering revenue as a business asset (what I fondly call the “money tree”), the website becomes a money pit for far too many businesses and brands. So many businesses and brands are forced to invest in compensating for the website, rather than correcting the inherent properties of the website itself. A website may fail to appear in search, fail to convert visitors to customers, unable to be updated, or serve as little more than a brochure. As a result, after investing in website creation, additional money will be required to realize performance the website was expected to deliver on its own. Brands will often turn to advertising, PPC or search engine marketing, monthly SEO programs, or maintenance programs to fill in the gaps. All of these methods can be powerful in the context of promotion, or required in leveraging a website. However, additional investment should not be required to make up for what a website should deliver on its own merit. Million Dollar Websites, reveals the most common mistakes, and empowers readers with best practices used by the web elite to deploy the most successful environments on the internet. If your success depends on a website in ANY way, this book is a must read. Written as a non-technical guide to every aspect of the website, this book engages deliberately engages the C-Suite, and entrepreneurs to take leadership to facilitate collaboration and proactive engagement with webmasters, web designers, programmers, SEO’s, internet marketers, PR, customer service, sales, marketing professionals as vital contributors to the website. Million Dollar Websites provides tools that facilitate communication that keeps everyone on the same page to create a website every stakeholder will be satisfied with. Today’s digital landscape demands speed. Customers, search engines, the media business owners, shareholders and stake-holders demand quality websites. There really is no time for you to learn-as-you-go. Most who have tried to build their own website will tell you that there is much more to a website than creating a few nice looking pages. Those who defer control to their in-house experts, agencies, vendors and consultants do so at their own peril. What you don’t know can, and likely will, cost you. Million Dollar Websites empowers businesses of any size to create a highly strategic website that doesn’t cost more, but is capable of delivering more. Million Dollar Websites puts you back in control of the website without having to learn code. Gain invaluable insight use to create the most effective digital environments on the web. Refer to Million Dollar Websites time and time again to apply timeless best-practices to emerging trends to prevent common mistakes and greatly increase the success potential of the website. So many websites fail do to lack of information. Writing the book is just the beginning in the quest to help businesses and brands create websites that can, and will, deliver the results they need to compete and win online. Join the discussion – Gain insights from the ‘Web Elite’! Join the web elite and other professionals of all levels seeking to build a better website on the Million Dollar Websites Google+ Community where we will feature Hangouts, website reviews and discussions about the latest web trends, real-world challenges, and support one another to build better websites. I’ve also created a LinkedIn Group to foster discussion about the website. So, buy the book and join the conversation! Speaker, Author, Entrepreneur, Futurist, CEO of an Award-Winning Consultancy and world-renowned expert. ☆ Your Guide to Exponential Growth in an Enlightened Economy ☆ I absolutely LOVE what I do! The enlightened economy is here. If you aren't continually evolving, you WILL be left behind. I have had the pleasure of working with Fortune 500, Silicon Valley start-up, Multi-national brands, Small Business owners, and everything in between. Today, I am passionate about helping entrepreneurs, businesses and brand-builders JUST LIKE YOU connect what you instinctively know with the latest data and science to build a powerful, sustainable business. Need a break-through strategy to build your business, pivot, grow market share, or increase brand equity? Let's talk. To your success!